So anyway, we’re gonna take a look at Kaai Yuki this week. Yuki was released at the same time as Miki and Hiyama Kiyoteru on December of last year. While Miki and Kiyo have enjoyed relative popularity due to the former’s unique character design and the latter’s uncommon male gender and great voice, Yuki seems to have been forgotten for the most part. Unfortunately Yuki’s relatively cold reception from producers has made it rather hard to find good songs from her. Most of the songs there were made for her are of the cutesy variety because of her appearance of a grade-schooler, but for me, her soft voice (which is sampled from real elementary school students) lends itself best to soulful slow ballads, which is exactly what you’ll hear today for the most part. First will start with a song by the name of “Forbidden Fruit”. Don’t let the title weird you out, though, as it’s not about some creepy guy lusting after little Yuki or anything, but rather a tragic tale of a doll slowly sinking into the cold the ocean, wishing to see her master’s smile one more time. The lyrics are available in the description of the video. Depressed yet? “Forbidden Fruit” isn’t the most technically impressive song, but I love the weight carried by Yuuki’s synthesized voice, which isn’t such a common thing with Vocaloids. If that didn’t get you down, let’s try a little harder? This is a subtle guitar solo song. If you’re interested in the translated lyrics they can be found here. Be warned – they are pretty depressing. Such beautiful melody… Even if the lyrics are a giant downer can’t help but to love the way her voice sounds in this song. You can almost imagine her sitting in a metro tunnel somewhere with her guitar case open, strumming away at the passing crowds. By this point you’re probably thinking I’m some sort of depressed nut who’s conspiring to make you all jump off a bridge or something, so lets inject a little levity into all this sadness shall we? I’m not sure what to say about this song other then its absurdly addictive! Oh god, I can’t get it out of my head! I literally replay this song 3 or 4 times every time it comes up on my MP3 player. Weird and addicting… Just how I like it! We’ll end things here with “Scherzone”. Sadly, I couldn’t find any translation of the lyrics, but frankly, I think it conveys enough emotion to cross the language barrier. The subtle melodic beats slowly weave through her soft vocals beautifully. Talk about ending with a bang. See, I don’t get why you think depressing stuff is a bad thing. Call me emo, but I think depressing songs lend themselves easier to a soulful experience than something cheerful and uplifting. The creative spirit burns brighter under a blanket of darkness, and I think these songs do a good job at illustrating that saying. I’ve never heard a Kaai Yuki song before (or Miki and Kiyoteru, for that matter), but boy, these Vocaloid voices are sounding more and more realistic with every release. I don’t claim to be well-versed in the Vocaloid universe, but Yuki’s voice has so much more emotional depth than any of the previous songs I’ve heard. As the distance between real voices and synthesized voices shorten, the role of vocals will become a musical instrument like any other, giving the artist even more freedom in their craft, especially those who do not have access to vocal talent. This thought makes me very, very happy. Haha well I was afraid it was pushing it this time…I love drama and sad things, but these are some out right suicidally depressing ones so I wasn’t exactly sure…Glad you liked em though! 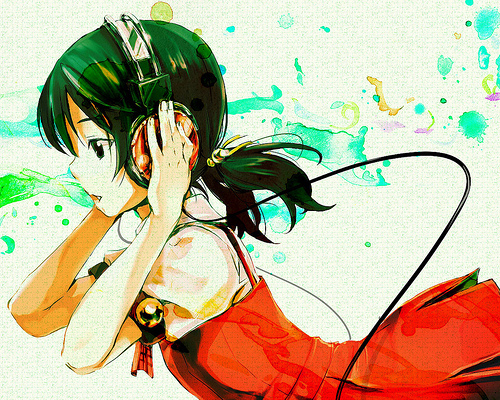 If you like Realistic you should defiantly check out Gumi though (I guess I could do a VC for her after Duets…). Out of all the Voca’s she can achieve the smoothest most “realistic” voice easily although the recently announced Iroha is really really good even though she’s only a demo version right now! It’s the first I’ve heard about this Vocaloid.